The Sydney Sixers should be able to finish the league phase with their 11th win. 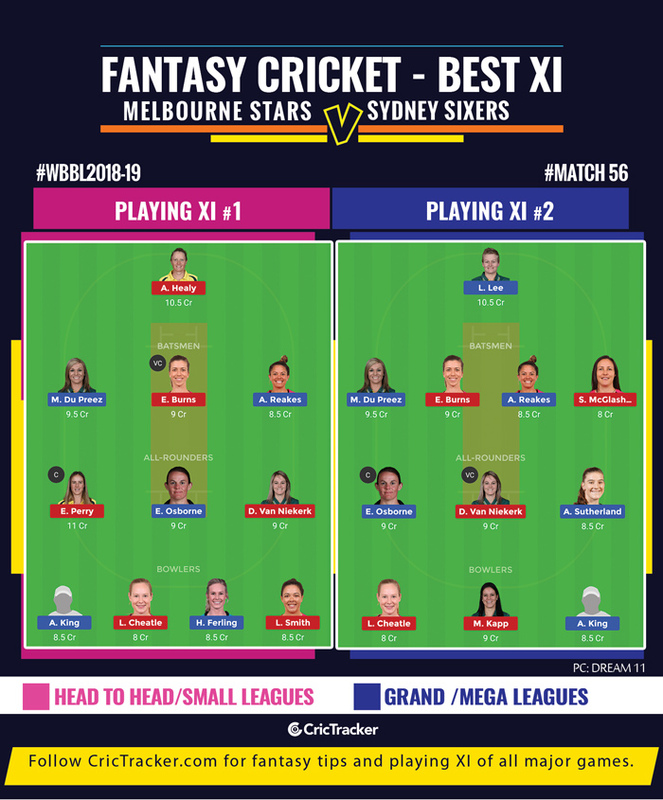 The league phase of the 2018-19 WBBL season comes to an end on Monday with Melbourne Stars hosting the table-toppers and the defending champions Sydney Sixers. The semi-final spots were finalized on Saturday while Sixers victory over Melbourne Renegades confirmed their top position. As a result, this game is not going to make any difference on the next round as the Stars are positioned at No.7 with four wins from 13 matches thus far. They began the season with four wins from their first seven matches but are still waiting for their 6th win. The Stars lost five of their previous six matches while another game ended without a result after ten overs of play. They will be hoping to finish the tournament with a win and have a chance of finishing at No.6 ahead of the Adelaide Strikers. The Stars and Sixers faced off on the first day of the tournament and the Stars gaining an upper hand. Thus, Sixers would like to settle the scores before heading into the semis. 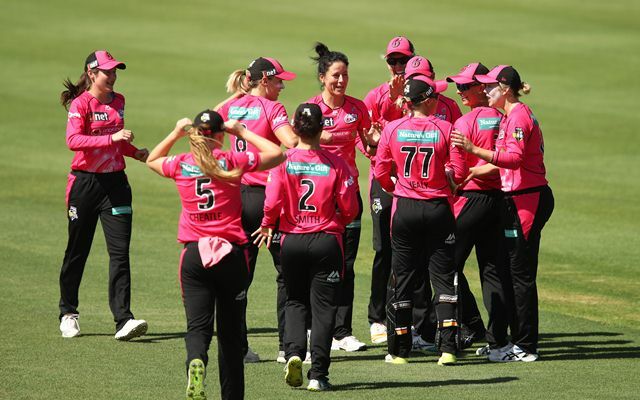 The 55th match of the Women’s Big Bash League (WBBL) will be played between Melbourne Stars and Sydney Sixers at the Melbourne Cricket Ground. The venue hosted the Melbourne Derby on New Year’s Day this season. Renegades, who batted first, posted 149/5 on the board. The Stars in response finished with only 101/7 in their 20 overs. During the last season’s WBBL, the average first innings score was only 124. Teams chasing won twice while one game ended in a Tie. Another time the team defending a total of 130 won by a 2-run margin. Kristen Beams (C), Mignon du Preez, Nicole Faltum, Holly Ferling, Nicola Hancock, Alana King, Lizelle Lee, Katie Mack, Katey Martin, Erin Osborne, Chloe Rafferty, Angela Reakes, Annabel Sutherland. Lauren Cheatle has been the X-factor for the Sydney Sixers. The young left-arm pacer has claimed 13 wickets from the 13 matches in the tournament. For Sixers, the South African couple Dane Van Niekerk and Marizanne Kapp have taken more wickets with 16 apiece. Ellyse Perry started slow scoring 2 runs from 16 runs against the Renegades before finishing with an unbeaten fifty. She is expected to be the top pick from this game once again. The likes of Erin Burns and Dane van Niekerk have to be considered as vice-captain. Melbourne Stars’ all-rounder Erin Osborne will be an ideal alternative. Picking either of Lizelle Lee or Alysa Healy will always be tough given their prowess but Healy gets an edge due to her recent form and consistency. However, Lee is destructive on her day and can make a difference as she did in the opening fixture. There are chances that Sydney Sixers sideline Ellyse Perry to allow others to have a bat in this fixture.